It has always been Magnetic Magnets' policy to treat our customers in exactly in the way we like to be treated ourselves. Our hair stands on end at the sight of small print. Our Terms and Conditions attempt to be "readable" and are intended to help clarify information and procedures for you the customer. You should note that your statutory rights under the Consumer Guarantees Act (1993), and Fair Trading Act (1986) are not affected. Security Policy: Our customers' security is of the utmost importance to us. For that reason we do not collect or store your credit card details. Instead we have elected to use PayPal to process credit cards transactions, thus providing our customers peace of mind that their details are secure. This has the additional benefit of providing separation between your personal details and your credit card details. Freight and Delivery: We will courier or post items depending on the size of the magnets and the delivery location. Rural deliveries will generally be sent by post. Magnetic Magnets makes every effort practical to ensure that delivery timeframes and stock levels given are accurate. 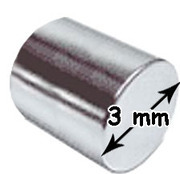 By placing an order, you agree not to hold Magnetic Magnets liable for any loss or damage directly or indirectly arising out of or in connection with any delay or failure to deliver within the estimated time frame. Site Use: The information contained in this website is for general information purposes only and is subject to change without notice. The information is provided by Magnetic Magnets and whilst we endeavour to keep the information up-to-date and correct, we make no representations or warranties of any kind, express or implied, about the completeness, accuracy, reliability, suitability or availability with respect to the website or the information, products, services, or related graphics contained on the website for any purpose. Any reliance you place on such information is therefore strictly at your own risk. Pricing Errors: In the event that a product is mistakenly listed at an incorrect price Magnetic Magnets reserves the right to refuse or cancel any orders placed. If you have paid for the purchase a credit will be issued by the same means you paid. Please contact us to request a return number. This will ensure your return is processed efficiently. We regret that Magnetic Magnets cannot be held responsible for non-delivery of returned goods or goods damaged in transit. We recommend that you use a "signature required courier" for any returns. Accepted returns shall be sent to Magnetic Magnets and must be received back within 14 days from the date of invoice. Refunds due to the three reasons above will be made by the same means with which you paid. Final Word: We have enjoyed an open and trusting relationship with our customers and we hope that the terms and conditions above actually help to clarify the relationship between us, rather than bog you down with small print. We would like to think that old fashion fair play would resolve most issues that arise.